Picture this... An Autumn day and some crisp and Crunchy leaves on the ground, but only a step or two before they become mulchy. And then no more than two steps later they are mushy and wet as your feet enter a greasy pond. Well, something like that anyway! Although these were thinly cut Crisps, and there was a few more broken Crisps than we would have liked, there was also a healthy dose of oil bubbling and a touch of visible seasoning. A Nose Plunge Test revealed a rather odd smell. It was like entering a chip shop before anyone has used Vinegar. An almost greasy, but pleasurable smell. The flavour however, hit the mark pretty well. 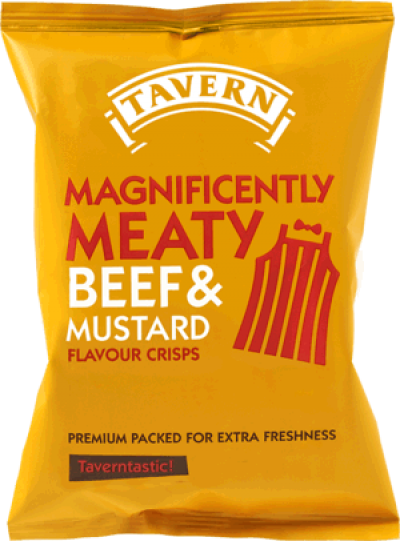 There was a nice, but mild English Mustard and a tinge of Beef as a backdrop. good effort.